Hi! I’m Christina. I’m new here! I am not, however, new to cloth diapering. I am a mom of two, both of whom have been cloth diapered at some point in their lives. My son Noah was born in 2007 and I began cloth diapering him at around a year old. I started off with a stash of 14 BumGenius 3.0 diapers and haven’t looked back since. I didn’t have the experience of cloth diapering a newborn with Noah, but I loved cloth diapers so much that when I found out we were expecting our second little one in the fall of 2010, I started planning for my newborn cloth diapers stash right away. I was a newbie again in a way, and needed to figure out what was going to work best for our daily routine (which included a toddler in diapers as well), my diapering preferences (which does not include Snappis), and our new little person (which we didn’t know the shape or size of). You can see how trying to cloth diaper a newborn is a bit of guessing game. What if you spend the money on a whole stash of adorable and teeny all-in-one diapers and you end up with a chunky nine pound baby that only fits in the newborn cloth diapering stage for 3 weeks??? Given that I had already produced one baby and he was pretty average sized at 7 lbs, 13 oz, I figured it was safe to assume that we would end up with something relatively similar, so I started ordering diapers a few at a time. That was the best decision we made, hands down. As soon as you find out you are expecting and that you are planning to cloth diaper your newborn, start buying a few diapers every few weeks. It won’t be such a shock to the wallet! As I finished my pre-baby newborn cloth diapering purchases, I ended up with a dozen preemie prefolds (I used preemie even though I was expecting a full-term baby because I prefer to trifold these and lay them in a cover instead of fasten them on (the choice is ultimately yours), a couple of Rumparooz newborn covers, a couple of Thirsties size 1 covers, and a couple of Bummis Super Whisper Wraps in newborn sizing, ten Kissaluvs size 0 fitteds that had been gently and briefly used, a couple of Fuzzibunz extra smalls, two Happy Heiny’s minis, two GroVia Newborns, and two Rumparooz Lil Joeys. You can see that I really didn’t commit to any one type of diapering system or brand of diapers. This was my saving grace, when one type didn’t work, I’d just move to the next one and when that one didn’t work anymore, I’d switch back. When my due date arrived and my sweet little girl did too, I was ecstatic to test out all of the tiny and adorable fluff I had carefully chosen for her, but I was a little concerned since what was supposed to be a tiny baby turned out to be an 8 lb, 12 oz ball of adorable chunk! She weighed almost a full pound more than my son did, but all I could do was hope for the best. The Lil Joeys were the first to get tested and they leaked through her tiny little sleeper. I figured I must have put it on wrong in my sleep-deprived stupor. I tried out my newborn cloth diapering GroVia AIO and it leaked worst than the previous diaper! The same thing happened when I tried the Fuzzibunz extra small and the Happy Heiny’s mini. Something was drastically wrong here, all of my carefully researched, AND expensive fluff was failing me!!! I finally broke down and started trying out the prefold and fitted options since nothing else was working well and to my relief, I finally had a dry baby. Unfortunately, now my stash was significantly smaller since none of my pocket or AIO options were working out. I had to run the wash routine daily until I could find the time (and energy) to get some more prefolds and covers. So now I had a baby girl in the 85th percentile for weight and half of a cloth diaper stash that was useable. Knowing that babies are nothing if not unpredictable, I figured I would deal with the prefolds and fitteds for a bit while I figured out what to do next. It seems as though my stash of pockets and AIOs were not fitting well because I had a skinny legged baby. So all that chunk was apparently in her adorable cheeks, just the ones on her face! She continued to prove this point as she promptly started dropping in percentiles. At her 2 month check, she was down to the 15th percentile and still had chicken legs to say the least. The same story continued at her 4 month check, where she neglected to top the scales and hit the 10th percentile. My little person, the one who started life at the top of the weight charts turned out to be just a little peanut with chicken legs and an inability to fit in the typical newborn cloth diaper. What did work really well for us though were those prefolds and fitteds with the newborn sized covers. The diapers I bought on a whim for emergency use only became the most frequently used and well-loved diapers in our stash. Once she did finally start filling out the leg openings of her newborn pockets and AIOs ironically, she also started wetting in too large of a quantity to be contained by the newborn sized inserts, so those diapers just weren’t made to be for us! On an up note, since she was such a peanut, she fit into her cloth diaper stash until just over 5 months, so we sure got our money’s worth out of those diapers! Now Addie is 7 months and fits into our stash of one-sized pocket diapers set on the lowest rise setting and we are off on our way again. 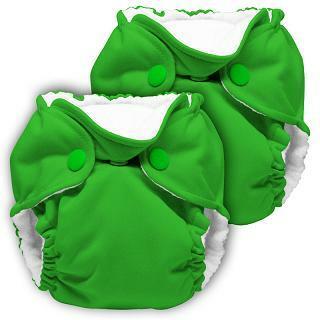 Even though newborn cloth diapering was nothing like I expected it would be, there are certainly enough diapering options out there to find something that will work for any size and shaped baby if you look around. And even though our newest little one hardly used many of the adorable newborn diapers in her stash, all of these diapers are in fabulous condition and can be resold to a new home where they will hopefully be more successful.